Crossroads Original Designs had been on my radar for a while. Having signed up to receive their promotional emails and newsletters, I had been notified of some pretty generous sales events. Then autumn swept in, and with it, my inevitable desire for pumpkin pie scents. Crossroads Original Designs ran a fall sale that hit around that same time. I’m telling you it was the perfect storm. I dove in, and Pumpkin Pie was at the top of my must-have list. 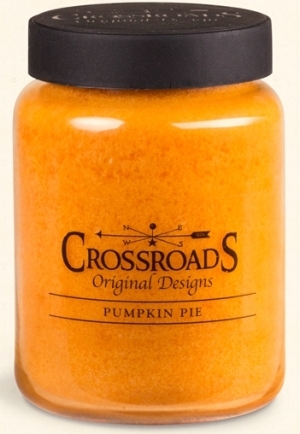 Before I share this slice of pumpkin pie, let me tell you about Crossroads Original Designs. It’s named after the street where it’s headquartered in Bucyrus, Ohio and founded by two brothers, Jason McMullen and Justin McMullen. This family owned business offers more than just candles. They’ve also got framed artwork, home décor and even an impressive variety of jams, jellies, and syrups available. That’s cool and all, but we’re here for the scented wax, right? Fear not. They’ve got us covered. I found wax in over 70 different fragrances! I found jar candles in six sizes, votives, tea lights, and tapers. Then on to the mini melts, crumbles, cubes, melters, sprays and reed diffusers. I loved the look of their candles! The clean jar design that Crossroads Original Designs offers is what pulled me in. My candle felt substantial and solid, like a shiny brick of wax. The color was a vibrant pumpkin orange. The lid was wide, giving the jar a cylindrical, sleek appearance, but it was plastic, so snuffing the flame with the lid was a no-go. (I dipped the wicks instead.) The label was understated, which I liked very much. The double wicks were lined up perfectly with the label. If you notice things like how the wicks line up, you’ll appreciate their attention to detail here. Okay, you now know about the company… now onto the candle itself! Let’s start off with the scent description for Pumpkin Pie. A warm mix of pumpkin, carrots, cinnamon and vanilla. Carrots? Not to my nose. I smelled a classic pumpkin pie scent. This scent was warm and sweet with a not-to-spicy cinnamon note. Before I read the description, I thought I smelled sweet pumpkin with cinnamon and even a buttery pie crust. 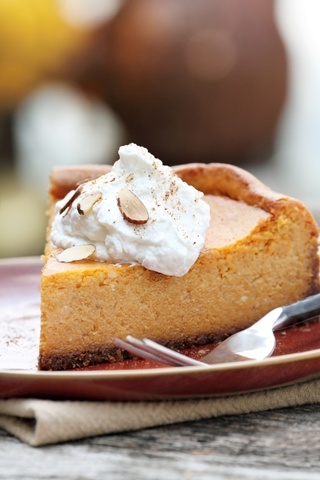 Was it simply the name Pumpkin Pie that made me detect notes of crust in there with the pumpkin? The description makes no claim to buttery crust. I sniffed this scrumptious scent for hours and I’d swear on a stack of pumpkins it smelled like the pie, the whole pie, and nothing but the pie. Strength – this scent had a medium throw. This one jar candle didn’t fill my entire house, but it certainly held my attention in my kitchen and hallway. I enjoyed walking past and catching a whiff of sweet baked pumpkin pie. For a time I kept it near me at my desk. I didn’t want to miss any moment of this scent. I loved it and will order Pumpkin Pie again. My candle burned well. The double wicks melted the wax from edge to edge forming a steady half inch melt pool. It burned cleanly during short burn sessions. Typical of paraffin wax candles, it required routine wick trimming in between regular burn times and twice during my super long burn session. I was pleased that both wicks held a strong, even flame. As the wax burned towards the bottom of the jar I noticed a bit of soot on the glass when I was more lax with my wick trimming. Admittedly, I have a soft spot for this growing candle company in Bucyrus, Ohio. I like that this company is located where it began, in America’s heartland. I like that their website looks professional and is easy to navigate, yet manages to hold onto it’s small town charm. My experience with Crossroads Original Designs was exceptional, from the ease of their website ordering process, to shipping speed, from their professional packaging to their well made products. My candle burned well and smelled like an autumn baker’s dream. Two thumbs up. Love Julia’s reviews? Read more here.